Popular music was no stranger to the Nottingham home where Ian Anderson Paice was born on June 29th, 1948. His father Keith had spent fifteen years on the road playing piano with dance bands during the 1930s and 40s but turned down the opportunity to tour internationally in favour of marriage and starting a family (a decision his son never did understand!). When Ian was seven the family moved to Bicester, near Oxford. A fellow school boy, Ian Hollaway, recalls Paice's dad encouraging his lad with plastic stretched across old biscuit tins. The local second­ary modern curriculum, favouring science over the arts, proved to be at odds with Paice's natural inclinations. After an equally frustrating experience at technical college, Ian had abandoned all academic aspirations by the time he was sixteen - drumming had taken over. "When I was 14 I was bashing around on the arms of sofas and biscuit tin lids and on my fifteenth birthday I got my first drum kit," says Ian. That kit, a red glitter Gigster, cost his father £32 I 2s 6d. "It was brilliantly awful but it was the best he could afford. After a few months he realised that it wasn't a passing fad and bought me a better kit, a (blue) Premier. After that I was away." Ian's first paid work as a drummer was with his father, Saturday night dinner and dance work, brush and hi-hat tapping to waltzes, foxtrots and quicksteps, for which he received £3 a night. "I never had any tuition on drums. My old man tried to teach me musical theory but I just wanted to go out and hit 'em." His abilities were put to better use in his first rock and roll group, Georgie and The Rave Ons, who played locally around the Oxford area. In mid-1965 The Rave Ons changed their name to The Shindigs. As well as Paice, they comprised Johnny Bosher on bass, Brian Nelson (no-one can remember what he did! ), Ian and Stuart Forrest on lead and rhythm guitars, plus George (Georgie, the band's namesake) Adams on vocals. The three resident Bicester area beat bands carved up the surrounding county; The Shindigs often played around the Banbury area, while The Apollos gigged out Oxford way and The Methods handled Aylesbury. The three groups would enter talent contests at the local Army base and often walk away with the first three prizes, much to the chagrin of other local but less talented outfits. Two singles sometimes attributed to the band, "One Little Letter" and "A Little While Back", were actually by a Crawley based group of the same name. The Shindigs also supported a Slough based outfit called M I Five on a number of occasions. 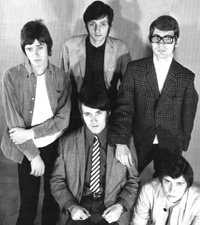 M I Five had begun life in 1965 when singer Rod Evans joined another Slough group, The Jumping Jimmy Band, and they decided to update their image. Evans had been fronting groups since he was 17 and was known locally for his rich, deep voice. Rod Evans was born on January 19th, 1947, in Edinburgh but his family moved to Slough when he was young and his friendship with Deep Purple roadie to be Mick Angus dated as far back as their nursery school, the William Penn School in Manor Park. Evans' family moved to the Priory Estate in nearby Burnham when he was five and he went on to attend the Haymill Secondary Modern School. His first band were The Horizons, a Slough based outfit that included among its ranks Lenny Hawkes, later Chip Hawkes of The Tremeloes, on bass guitar. "Rod used to be a big Cliff Bennett fan", says Mick Angus. "He modelled his style on Bennett and Allan Clarke of The Mollies." The Horizons played a lot of Curtis Mayfield material and travelled around more than most local bands, including the clubs in Hamburg - where they lived on Swiss rolls for a week due to the terrible pay. "They'd had to do run-outs from cafes after eating. Rod would leave first and draw up by the door of the cafe in their van. Then the others would make a dash for it", recalls Angus. To supplement his income, Evans also did a bit of fashion modelling on the side. The Horizons never recorded (despite winning a local band contest at the Slough Community Centre that was judged by Alan Bown) and continued on the local circuit doing beat covers, finally breaking up after returning from their 1965 Star Club stint. As Hawkes says "When we came home the band sort of broke up because we were so young". Their drummer had already been unable to play in Hamburg as performers were required to be at least 18 years old. Future Episode Six drummer John Kerrison had deputised. When M I Five's drummer quit they began looking around for a replacement, cast envious glances at The Shindigs and promptly offered Ian Paice the gig. Paice saw that the new outfit offered a more professional set-up and accepted. The Shindigs disbanded with two of the band joining The Methods. With Ian's arrival, M I Five turned professional despite their lack of a recording contract. To be nearer to the group's base of operations Ian Paice moved away from Bicester and lodged in Slough or stayed with keyboard player Chris Banham's family in Windsor. Shortly after Paice's arrival around June 1966 the band cut their first single, "You'll Never Stop Me Loving You" issued in September on Parlophone and recorded on a single track machine, before deciding in October / November 1966 to change their name to The Maze (not to be confused with an American band of the same name!). 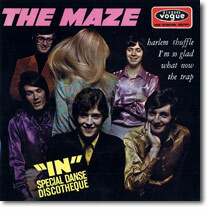 The Maze's second disc "Hello Stranger" was made for Robert Stigwood's Reaction label in December 1966. The a-side (penned by the guitarist) was another slow ballad with strings and a slightly increased production budget judging by the sound of things, bringing Rod's moody performance to the fore. The b-side was somewhat livlier with Paice bashing about, and quite catchy too. As well as gigs in the U.K. The Maze also played the German circuit and in January 1967 began a three month season in Italy where bizarrely they provided the live backing for a musical version of Arnold Wesker's play "Chips With Everything" at The Piccolo Teatro in Milan. "We never saw the audience once!" recalled Paice later. They even issued an impossibly rare Italian only single during their stay, intended as a promotional item for the play. The two tracks were "Aria del Sud" and "'Non fatemi odiare", written by the producers of the play. To promote it they appeared on local television. The band also recorded a very rare French only EP 'live in the studio' in Milan, with the view of reproducing their live sound. It included a version of Skip James' "I'm So Glad", which is a fascinating insight, if anything even heavier than the version Deep Purple taped a year later: Some great over the top drumming on it, hinting at what he must have been like on-stage. "The Trap" was an interesting instrumental again with some good drumming, while the other two were fairly ordinary covers. It is extremely rare, and even more desireable for the incredible full colour sleeve. "On the boat trip over I met this guy called Ritchie Blackmore who was on his way to Hamburg", says Ian Paice. "I'd heard about him, what a great guitar player he was supposed to be, and we had a talk but that was all... never thought anything about it but after the job in Milan, The Maze got a three week booking at the Star Club in Hamburg and we met again." Blackmore got to check Ian out on stage and took note of Ian's style, how he filled in the breaks with fast rolls and snappy rim-shots, almost treating each number as if it were a personal tour de force, a minor drum solo in itself. Blackmore was so impressed he offered Paice a job on the spot. As he didn't actually have a band at the time, Paice wisely declined; "I couldn't because I needed the money my band was earning." 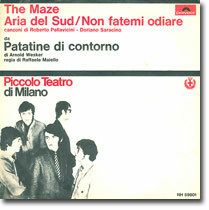 The Maze's last single, released on December 6th 1967 on MGM, was an Italian ballad "Cateri Cateri". Rod Evans turned in an impressive performance, though Cateri can't have stood much chance of being a hit. The slightly more up tempo b-side "Easy Street" may have stood a better chance. The band's break even point was £75 a week, £15 each, and though they often accomplished this, disillusionment after their lack of any real success (and the lacklustre sales of the singles) was setting in by the start of 1968. It was Rod Evans who was first to jump ship. He heard his friend Mick Angus talking about going after a singing job advertised in Melody Maker and had no qualms about digging out the paper and replying to the advert himself. "He got the job and when he went to audition Ritchie asked him what I was going to do if The Maze broke up", says Ian Paice. "What happened next was that I went along to a rehearsal when their original drummer wasn't around and it was agreed that I'd join the band too. It was pure chance really. If Mick hadn't told Rod, and Rod hadn't got the job I'd never have known about the gig." The Maze : Cateri Cateri / Easy Street single is available is included on the Purple Records 'Pre Purple People' collection. You'll Never Stop Me Loving You/Only Time Will Tell single is included on the Deep Purple 'Listen, Learn, Read On' box set. On 3rd July 1966 Rod Evans and Ian Paice carried out their promotional duties for the new line-up of M I Five by dropping along to the pirate radio station's 'Field's Fab Forty' roadshow at the Marquee Club, London and signing their 'Knees Club' (?) guest book. "Groups rarely did live performances during the Saturday afternoon show, usually appearing simply for the purpose of being interviewed by the host DJ to promote a current single. An airing of said disc would be followed by an autograph session at the side of the stage. Only days earlier, on July 1st, two other future Deep Purple people, Roger Glover (#305) and Ian Gillan (#306) had joined the Knees Club when Episode Six signed up at Beaconsfield Youth Club." "On April 25th, a couple of months before the other Purple people, Ritchie Blackmore had joined the Knees Club from Neil Christian's Crusaders, becoming member #220 at Wycombe Town Hall. Christian's single 'Oops' was banned from being played on both Ready Steady Go and Five O'Clock Club, as the lyrics were deemed overly sexually-suggestive for early-evening TV. Neil Christian had been on tour to promote his only national chart success 'That's Nice'. His Crusaders backing group for that tour were Jimmy 'Tornado' Evans (#219), Tony Marsh (#221), Avid Andersen (#222), and Ritchie Blackmore (#220). Group Manager, (or Road Manager) Ron Watell also joined (#224). Sadly, the group decided to scribble fictitious names and vulgar comments in the sacred Knees Club Book. I obviously did not think much of them, as I wrote in my diary, "Haven't had such a lousy time in years".